Here's a hint it's in the name of the machine, and it's not the word oven. Microwave ovens use microwaves. This spectrum ranges from radio waves and microwaves, to infra-red, visible light, ultraviolet, and x-rays. 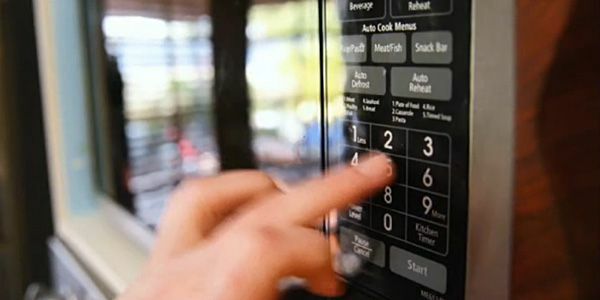 Now when you press start on your microwave oven, it fires a blast of microwaves at your food. The energy in the microwaves excites water molecules in the food. The excited water molecules vibrate back and forth producing heat. And this heat cooks your food. 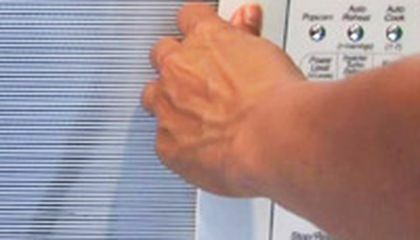 The great thing about microwaves is that they are at the right frequency to excite water molecules, but don't vibrate things like metal or plastic. Which is a good thing, because who wants to eat cooked plastic? Critical thinking challenge: What else moves back and forth to produce heat? What is the name of that force that produces heat? Getting blood from dogs? Easy! But cats? Not so much. The only thing that comes to my head whenever I think about that is a light bulb. I am not sure if it is right but, it's the only thing that comes to mind. But I did figure out why we do not put aluminum in the micrwave. Now I know how microwaves cook food. That is very neat I never knew that about microwaves. Another thing that produces heat is the sun. Another thing is an oven. dint microwaves make people explode after ALl those toxins release from the microwave each time you open it. so why dint we make a safer thing to cook food and its just like cell phones . they give of bad energy so why do we have them . That's cool but isint microwaves bad with toxicns everytime you open it? What also moves back in fourth is water molecules. They move back and forth and they produce heat. The name is microwaves and those are the water molecules that move back and forth.